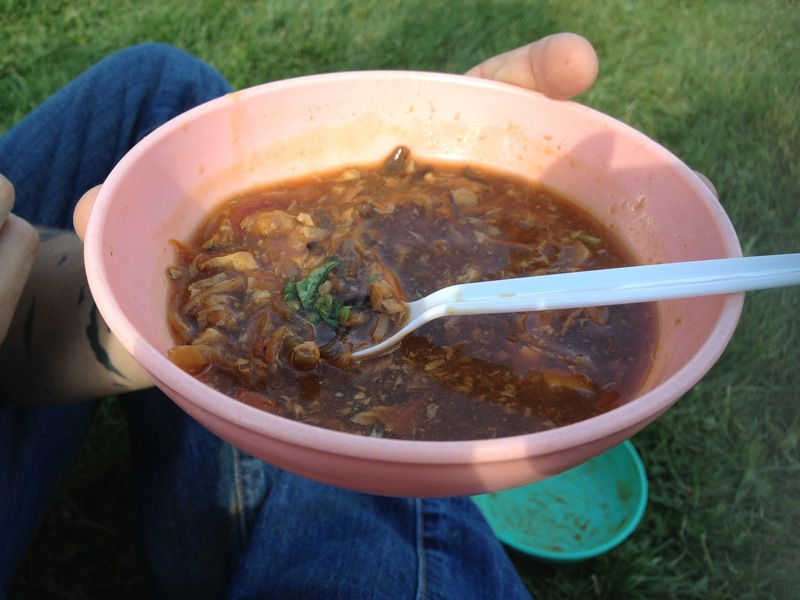 Yesterday I attended Soupstock at Woodbine Park. 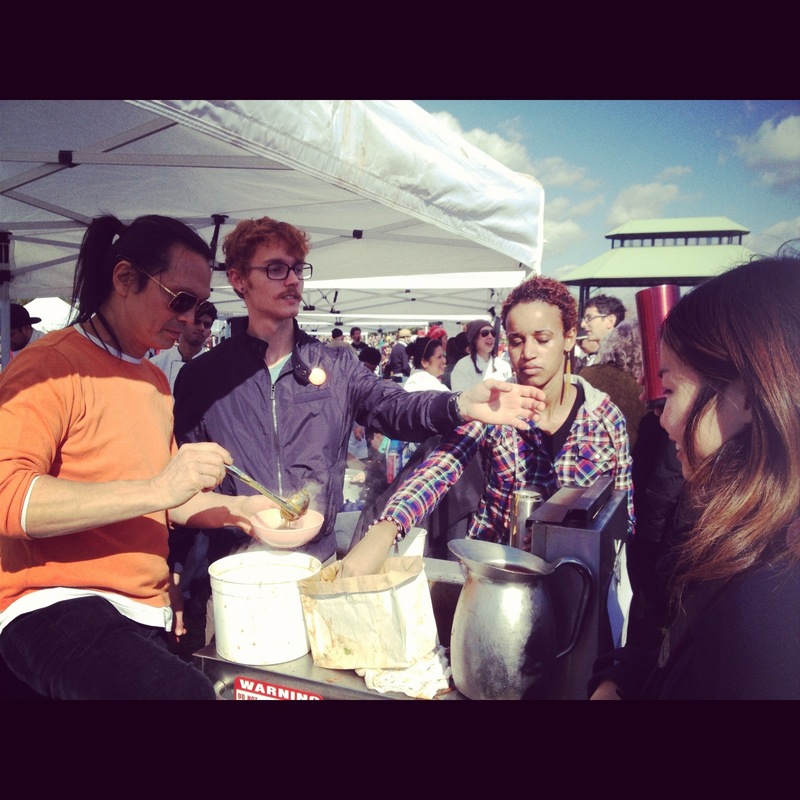 There were over 40,000 people in attendance trying out soups from 85 different booths. 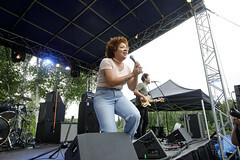 Bands also played in support of their land. 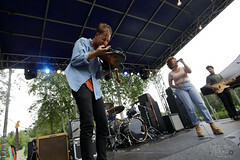 The festival existed to raise funds to stop and raise awareness for the high-land mega-quarry. To put it shortly, the Highland companies want to blast a pit deeper than the Niagara falls in more than 2300 acres of farm land in Ontario. It would also require tons of water to be removed from the pit every day, water that people who live downstream from it need. All this just for some limestone. Though many people (including myself) originally came just for the soup, most learnt about and supported the cause. Nash signing a giant petition. Soup tickets were $10 for 3 and me and Nash bought 6 altogether. I brought my own bowls from home. I brought these old ugly ones because we chucked them away before heading off to a concert for the night. 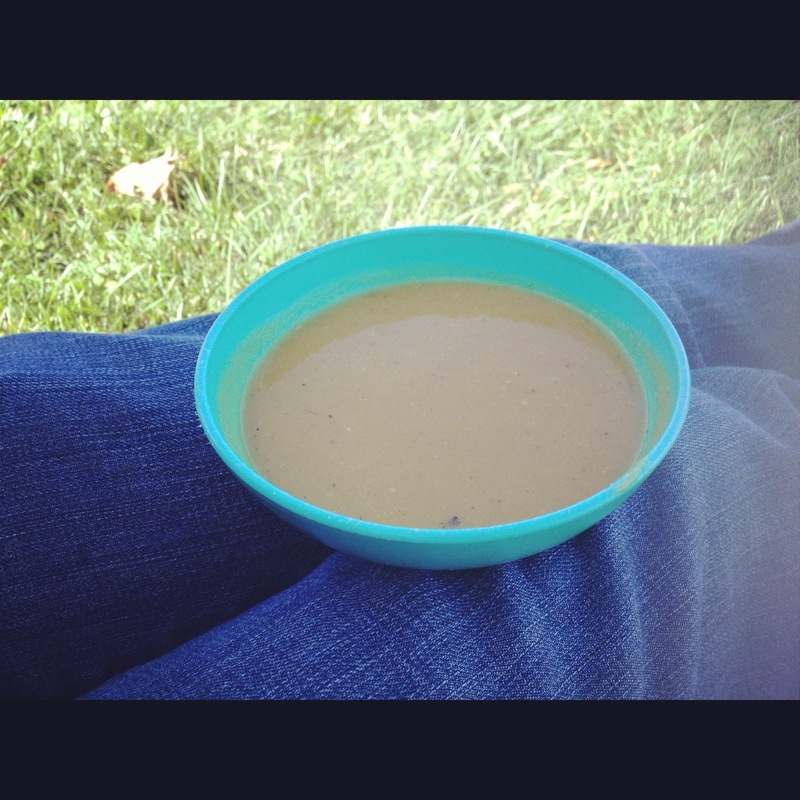 The first soup we had was a Pumpkin, squash and pear soup. The booth was in a corner, and lines were non-existent, but it was actually one of my favourites. I generally love butternut squash soup but this was perfect in texture. It was bursting with flavour and the hint of pear was lovely. It wasn’t something we immediately tasted, but when thought about, it was definitely there. Next we braved a line at the Rock Lobster soup tent. We both unanimously decided that it was definitely not worth the wait. The broth was too thin, and almost water-like. It was also pretty flavourless, or rather had a strange after taste that felt like spicy, but was definitely not spicy. There were a handful of mini lobster pieces, but not enough for it to have been worth the long line. 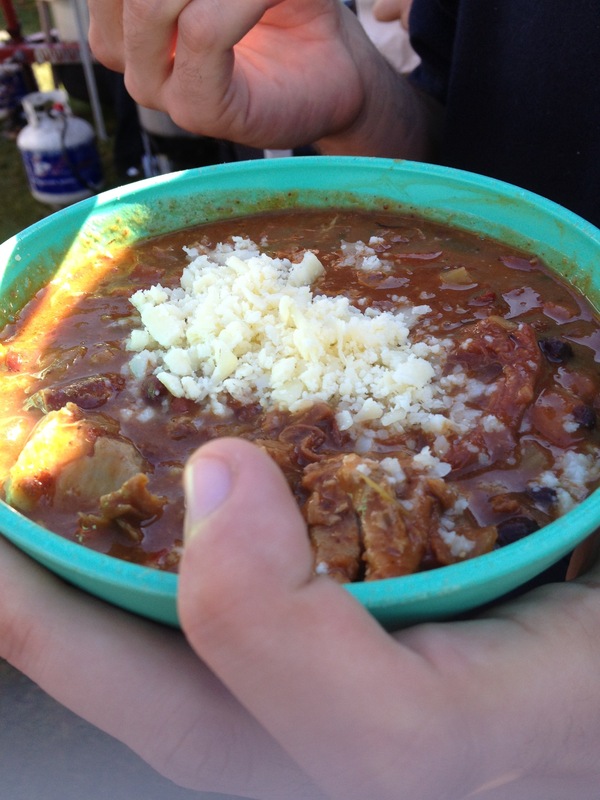 After that thin soup, I wanted something with more substance so we tried the chili. It wasn’t spicy, but they had plenty of hot sauce at their station to add whatever amount of heat was desired. We dabbed quite a bit and enjoyed the filling beans, meat and cheese combo. Up until this point we were just wandering about looking at the stands without a map, but while in line for chili, I heard one of my favourite food network chefs Susur Lee was serving soup! I haven’t been to his restaurant yet (not in my budget) but I have tried a couple of his items at various other food festivals. Sunday he was serving hot and sour soup! To be honest, I’m not regularly a fan of hot and sour soup. I always thought it was one of those fake Asian foods made for white folk. However Susur’s was delicious! There were a ton of flavours going on including a mouthful of flowery coriander. The ingredients in his soup reminded me of shark fin soup (which I have had plenty as a kid), without the shark fin. Since the lobster soup was a fail, we decided not to judge a soup by its line. Instead for the last two, we went to booths with virtually no line at all. The first was the Fraser Cafe which had a lemongrass noodle soup. 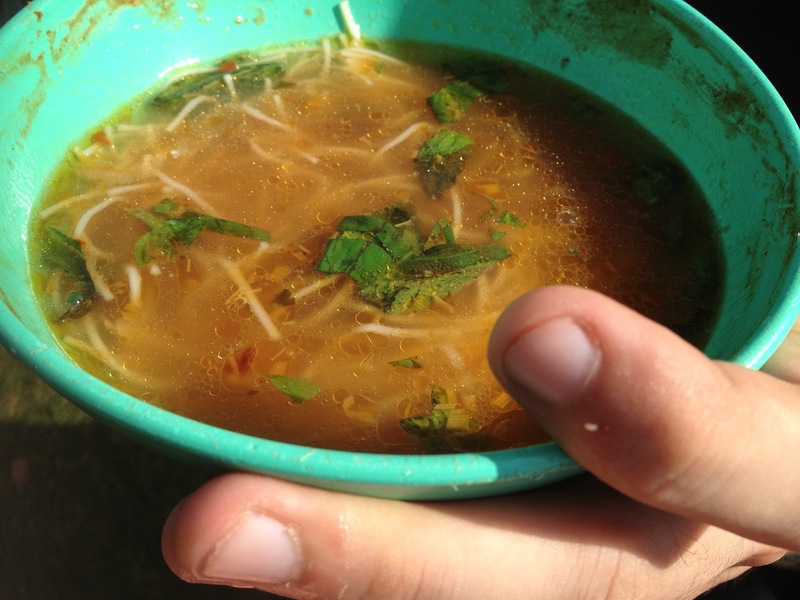 There was a strong flavour of lemongrass, and pieces of it were visible in the soup. The noodles were thin and soaked up the flavour. 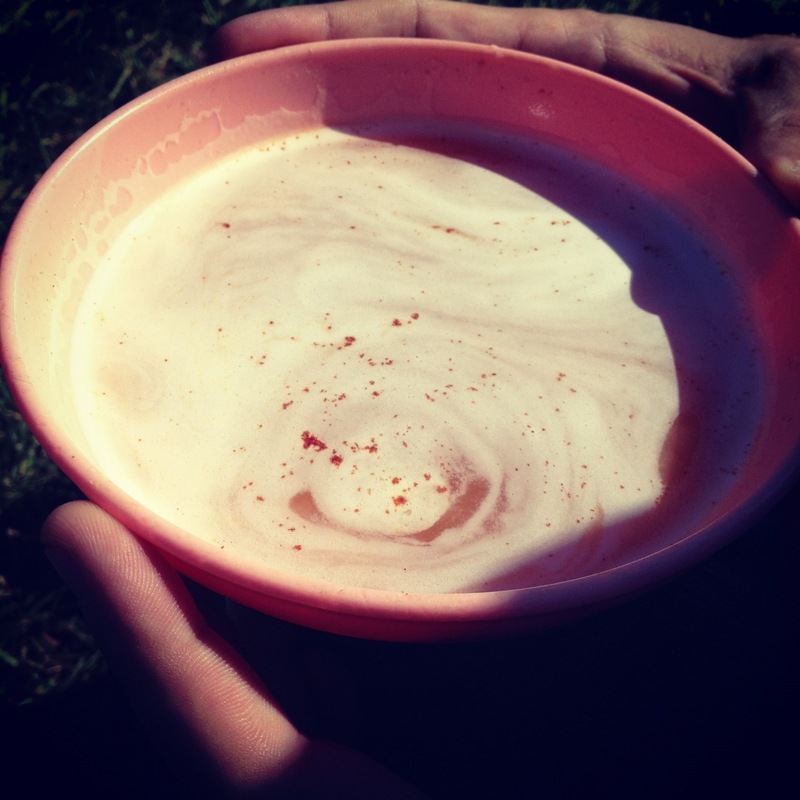 Strangely, it almost kind of reminded me of the pumpkin soup in aftertaste. Lastly, we got a potato leek soup with sweet breads in it. Sweetbreads, just as a reminder is weird organ meat. We’ve tried it once before at last year’s Food and Wine festival. The potato leek soup was perfectly thick. The sweetbreads were thick and this time, we didn’t mind the texture at all. 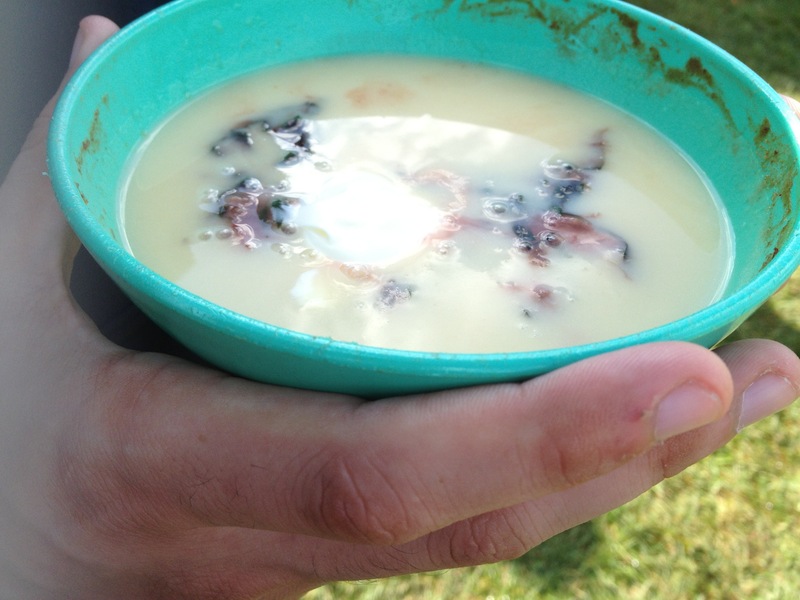 In this soup it was a soft meaty delicacy. 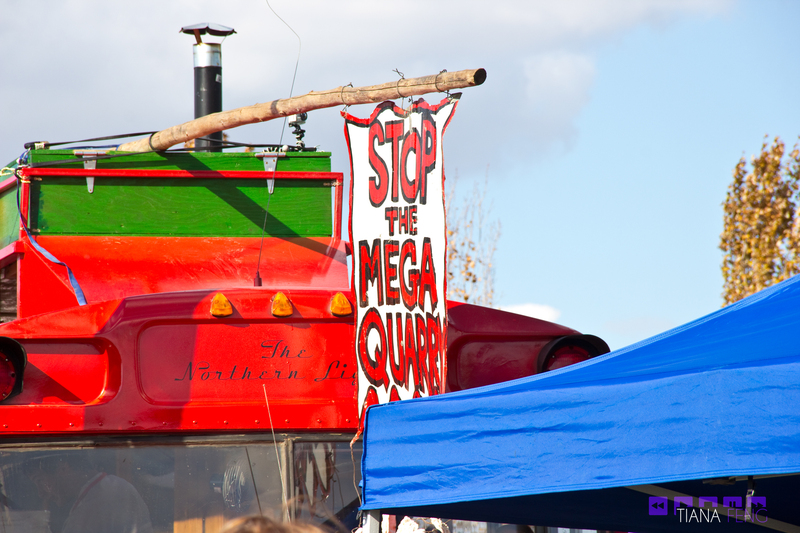 Though I hope the mega-quarry doesn’t happen, I hope another Soupstock does, even if to raise support for another cause. It was a lovely Sunday, with a lovely mixture of happy people, food and music.